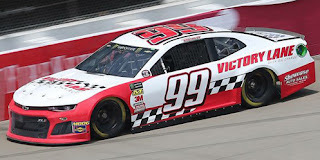 Garrett Smithley picked up the 1st last-place finish of his Monster Energy NASCAR Cup Series career in Sunday’s FireKeepers Casino 400 at the Michigan International Speedway when his #99 Victory Lane Quick Oil Change Chevrolet fell out with transmission issues after 1 of 133 laps. The finish occurred in Smithley’s series debut. It is the first for StarCom Racing since Landon Cassill’s rear gear issues at Martinsville in March. In the Cup Series last-place rankings, it’s the 16th for car #99, the 77th by reason of transmission issues, and the 747th for Chevrolet. Across NASCAR’s top three series, it’s the 30th for the #99, the 157th by reason of transmission trouble, and the 1,603rd for Chevrolet. Last Tuesday, June 5, StarCom Racing announced that Smithley would be making his Cup Series debut in Sunday’s Michigan race, driving the #99 Chevrolet previously fielded by StarCom team owner Derrike Cope. It would be a reunion of sorts for Smithley and Cope. 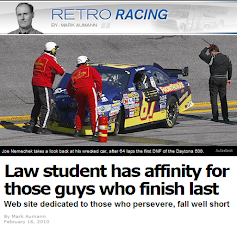 The two crossed paths when Smithley was testing an ARCA car for the Keselowski family at Daytona. According to his website, Smithley, born in Reed Sorenson’s hometown of Peachtree City, Georgia, is something of a stock car racing prodigy. In 2007, he was the Rookie of the Year in Bandoleros, and soon after was winning races and championships in the U.S. Legends Car Series. He was then invited to compete in Richard Petty’s national driver development program, and had so impressed the staff that, by the time he met Cope, he was the lead instructor for the Richard Petty Driving Experience. Following his test with the Keselowskis, Smithley was invited by Cope to run a handful of ARCA Racing Series events. His series debut came at Pocono on June 8, 2013, when he moved from 33rd in the 34-car field to finish 17th. He improved with a 14th in his return to Pocono in August, then the next year ran a one-off for Wes Gonder at Talladega, finishing 18th. Cope then fielded Smithley’s first XFINITY ride in the 2015 finale at Homestead, where he ran 28th. The run closed out a season where Smithley gained SegPay as a sponsor for four Truck Series efforts with Mike Mittler’s MB Motorsports. 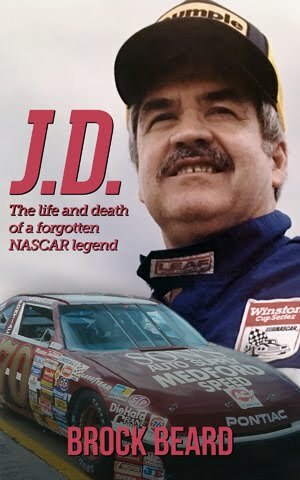 His best run in that series was a 14th at Michigan. Smithley is perhaps best known for his current XFNITY Series effort in the “Number Nuthin,” the #0 Chevrolet fielded by Johnny Davis at JD Motorsports. Smithley’s first start with the team came February 27, 2016 at Atlanta, when he took over the ride from Eric McClure and finished 24th. 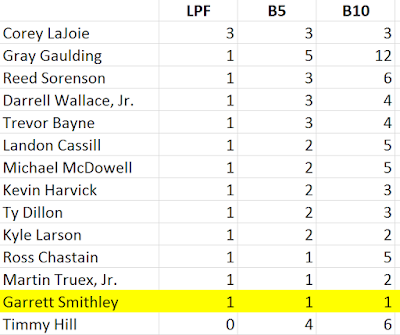 A 12th at Talladega and a 13th at Daytona were the highlights of a season that saw Smithley finish 18th in the standings. He stood 21st in points last year with a new career-best of 8th in the Daytona opener, then a 10th at Iowa, his first top-ten performances in the series. The 2018 season has seen Smithley earn his first Top Five – again at Daytona, where he finished 5th – and he’s paced the field for five laps, most recently his solid 14th-place showing last month at Charlotte. 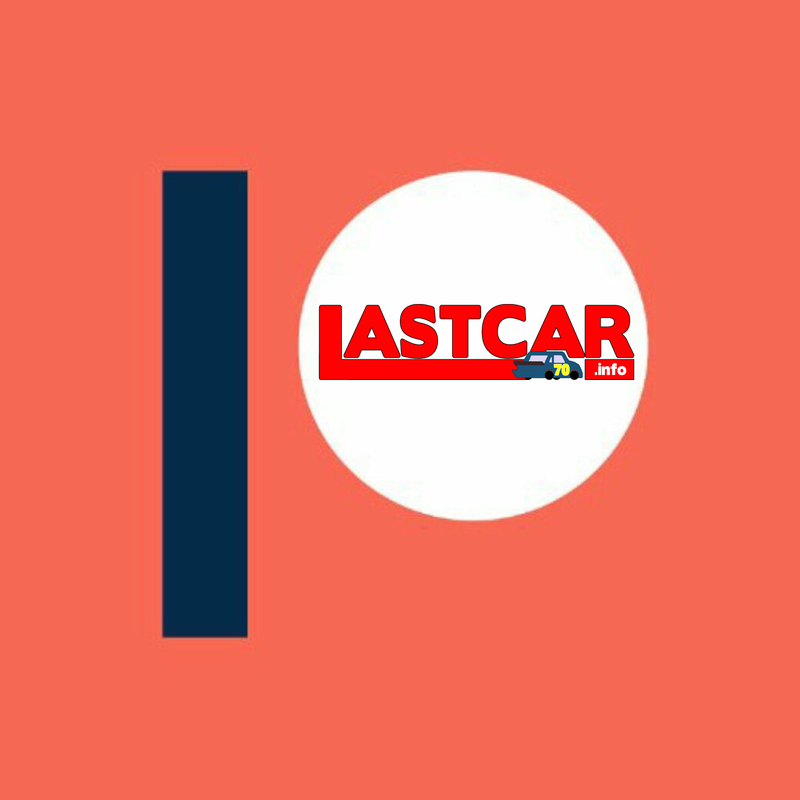 His #0 Chevrolet carried new sponsorship for Saturday’s XFINITY event at Michigan. Through the same weekend as his planned Cup debut, Smithley ran 25th and 22nd in the two practices, lined up 22nd on points after a qualifying rain-out, and finished 26th due to engine trouble. On the Cup side, Smithley’s #99 carried a new look for what would be the third start of 2018 for StarCom Racing’s second team. New sponsorship arrived from Michigan franchise Victory Lane Quick Oil Change with associate backing from Showcase Auto Sales. In Friday’s opening Cup practice, the car ran 38th of the 39 entered teams, outpacing Timmy Hill in Motorsports Business Management’s #66 MBM Motorsports / CrashClaimsR.us Toyota by four-thousandths of a second. Smithley qualified slowest overall with a 186.552mph (38.618 seconds), then again edged Hill for 38th in the second practice, this time by 0.150 second. Happy Hour was washed out. 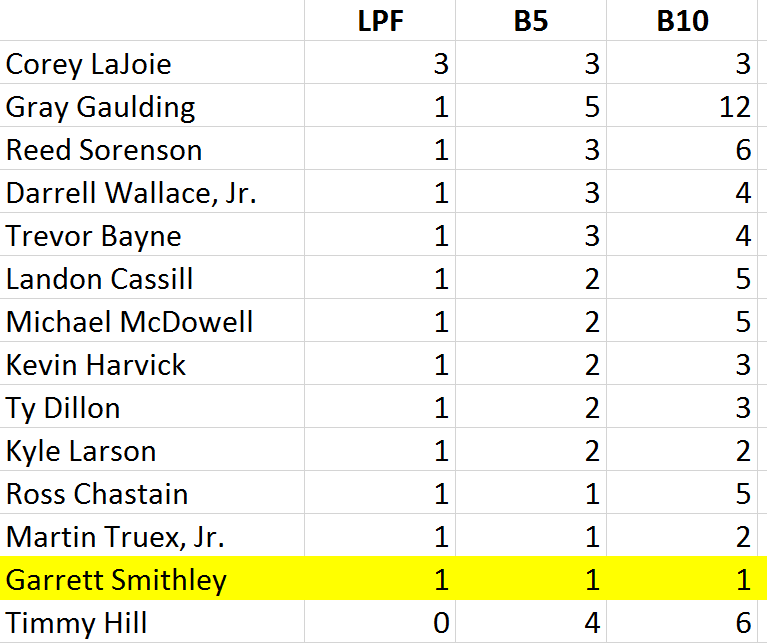 Prior to the race, we tweeted that Smithley was one of only seven drivers in the field who had never finished last in a Cup Series race. The statistic arose because of a lesser-known streak coming into Michigan where the last three rounds saw a driver trail their first Cup race (Ty Dillon at Kansas, Kevin Harvick at Charlotte, and Darrell Wallace, Jr. at Pocono). There hadn’t been a streak of four first-timers since 1983, which saw a run of eight from April through June. Smithley responded with the “See-No Evil Monkey” emoji. Joining Smithley in the back of the field were Joe Gibbs Racing teammates Denny Hamlin, Kyle Busch, and Erik Jones, who were all sent to the rear for failing inspection due to a splitter infraction. When the green flag fell, Smithley retook the spot from the trio, and pulled down pit road after the opening lap. The crew discovered a transmission issue, and pushed the car behind the wall. 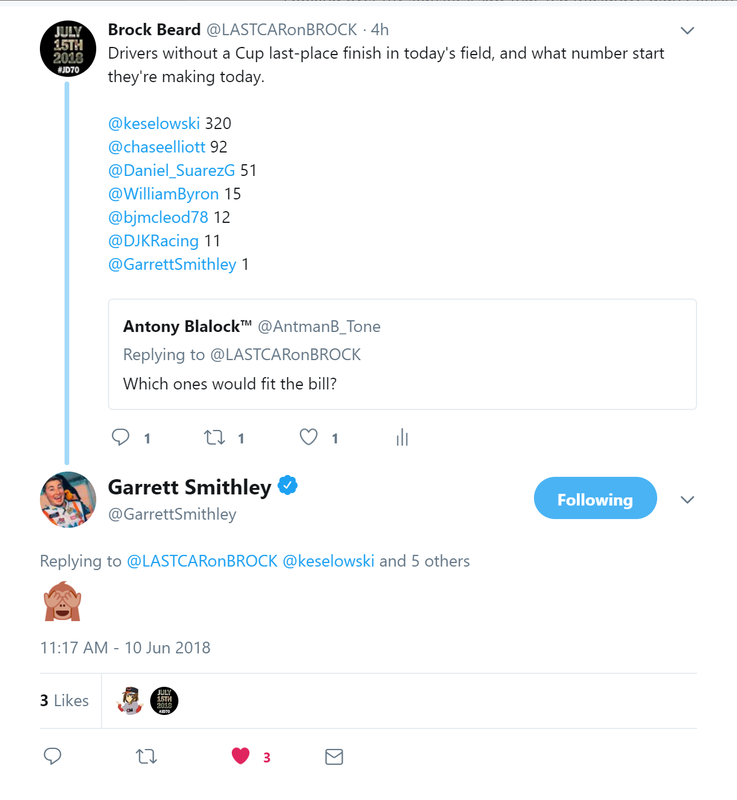 By the end of Stage 1, Smithley was listed out of the race. 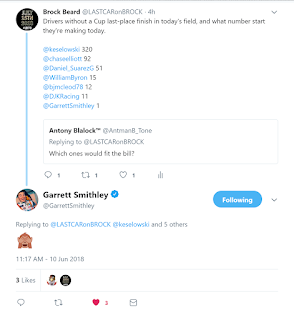 This made Smithley the first Cup driver to finish last in his Cup debut since Ray Black, Jr. last September at Chicagoland. Finishing 38th was David Ragan, whose #38 MDS Transport Ford backed into the wall in Turn 2 after Pocono last-placer Darrell Wallace, Jr. slid into him on the inside. It was Ragan's first bottom-five finish of 2018. 37th fell to B.J. McLeod, who struggled with handling issues and finished the last car under power, two laps behind race winner Clint Bowyer. Also two laps down was 36th-place Matt DiBenedetto in the #32 Can-Am / Wholey Ford. Rounding out the Bottom Five was Timmy Hill, the last driver one lap down. *Smithley is the first Cup driver to finish last while making his Cup debut at Michigan since August 20, 2000, when Kerry Earnhardt wrecked the #71 RealTree Camouflage Chevrolet after 5 laps of the Pepsi 400 presented by Meijer. *This is the first time the last-place finisher of a Cup race at Michigan only completed 1 lap since June 15, 2003, when Ricky Rudd’s #21 Motorcraft Ford was involved in an accident with Ken Schrader’s #49 Blair.com Dodge in the Sirius 400. Rudd was classified last behind Schrader, who started four spots ahead. 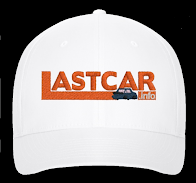 *This marked the first last-place finish for car #99 in a Cup Series race since February 19, 2006, when Carl Edwards’ #99 Office Depot Ford crashed 78 laps into the Daytona 500. It was Edwards’ only last-place finish in the series. *This marked the first time the #99 finished last in a Cup race at Michigan, and the first time a Cup driver finished last here with transmission issues. Was Smithley the first Start & Park we've seen in the Cup Series in thankfully quite a while? Definitely not a start-and-park. They had full sponsorship. This time, an unfortunate mechanical issue.